Dr. Ohhira’s Probiotics is a line of multiple probiotic and prebiotic supplements designed to support digestive health, immunity and general well-being. Dr. Ohhira Probiotics have won best supplement of the year 5 times in a row from Better Nutrition Magazine. In additional to oral dietary supplements, this company also sells probiotic soaps and skin lotions. Dr Ohhira probiotics products are recommended for use by athletic trainers and health and wellness professionals. These probiotics are also a suggested product for the treatment of Crohn’s disease and IBS (Irritable Bowel Syndrome). 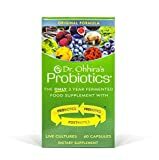 The most popular product is the Dr. Ohhira’s Probiotic Original Formula supplement, which contains a blend of 12 strains of lactic acid bacteria, vitamins, minerals, amino acids and naturally occurring FOS (a prebiotic). Dr. Ohhiroa probiotics are purported to balance the microflora, relieve occasional gas and heartburn, maintain a healthy intestinal pH and digestive function and support immune responses. Use of a probiotic is also purported to support the absorption of nutrients from food and other supplements and restore balance of good to bad bacteria which can be disrupted by stress, diet, and lifestyle factors. Sports trainers suggest taking probiotics because they reduce muscle inflammation and help athletes process carbohydrates more efficiently. These probiotics also form beneficial temporary colonies to allow the natural flora in the stomach time to recover from depletion. Each capsule has a Proprietary Organic Acid Blend (1.27mg) made up of citric acid, lactic acid, formic acid and Proprietary Lactic Acid Bacteria Blend consisting of 900 million CFU’s (colony forming units). It is the combination of this probiotic formula, not just the numbers of CFU’s, that supports enzyme activity and digestion, reduce inflammation, alleviate toxins and help normalize pH balance in the colon. Dr. Ohhira Probiotic supplements are used to manage Lactose Intolerance. The use of this product is being studied as a prevention of Colon Cancer. Lower rates of colon cancer exist among higher consumers of fermented dairy products in some population studies. A recent article about a study done by the Leiden Institute of Brain and Cognition states that taking probiotics improves mood. These findings have applications in the treatment of anxiety, depression, bipolar disorder as well as general mood enhancement and stress relief. Probiotics need to be taken at least a couple times a week to help the intestinal microecology. This supplement may help lower cholesterol. It may also be beneficial in lowering blood pressure, though more research is needed to understand this mechanism of action. This supplement also helps improve Immune Function. It is observed to prevent infection by increasing the number of IgA-producing plasma cells, increasing or improving phagocytosis (the engulfing of microorganisms or other cells and foreign particles by phagocytes) as well as increasing the proportion of T lymphocytes and Natural Killer cells. LAB (lactic acid-bacteria) foods and Dr. Ohhira Probiotic supplements are used to treat and prevent acute diarrhea. These supplements also decrease the length and severity of rotavirus infections in children. LAB’s also help antibiotic associated and traveler’s diarrhea in adults. It is also used to treat women with recurrent vaginosis, particularly yeast infections caused by the candida bacteria. Probiotics have also been recommended as an adjunct therapy in the treatment of Chrohns and IBS (Irritable Bowel Syndrome). Speak to your doctor to learn more about the use of probiotics for these conditions. The growth production process of Dr. Ohhira probiotics requires from 3 to 5 years of fermentation. This extended fermentation process enables the strains of bacteria to grow and proliferate to a greater degree. The combination of ingredients and this fermentation process is what makes this product different from other products available. Six Wild Fruits: Chinese matrimony (Lycium Chinese), Wild vine (Vitis coignetiae),Chinese bayberry (Myrica rubra), Mulberry (Morus Australis), Wild strawberry (Rubus buergeri), and Oleaster (Elaeagnus Montana). Two Seaweeds: Sea tangle (Laminaria japonica) and Brown seaweed (Hizikia fusiforme). Two Herbs: Mugwort (Aritemisia montana) and Broad-leafed plantain (Plantago asiatica). 12 strains of live lactic acid bacteria fermented in a natural temperature environment for three years. The suggested dosage is to take one capsule twice a day on an empty stomach (1 hour before or 1 1/2 hours after meal) or as directed by your primary health care provider. There may be some minor bloating and a mild laxative or constipating effect. These are signs that the beneficial bacteria are remodeling, detoxifying, and improving the gut environment. If these symptoms last for longer than 10 days it is suggested to consult your health care provider. Dr. Ohhira’s Probiotics, Supplements and Skin Products are non-GMO and hypoallergenic (no dairy, no gluten). These probiotics are 100% vegetarian and are stable without refrigeration. The use of probiotics for the treatment of any disorder should be under medical supervision. Probiotics are usually well tolerated by most people, with very few side effects reported. However, individuals with weakened immune systems should speak to their doctor before using Dr. Ohhira’s probiotic supplements. Four cases of Saccharomyces boulardii fungemia have been reported. These cases are thought to be due to catheter contamination. There have been few reports of Lactobacillus bacteremia and endocarditis. (heart infection). In all these cases, there were underlying medical conditions such as cancer, diabetes mellitus and recent surgery. It is not recommended to give probiotics to infants under six month of age as it may cause allergies to cow’s milk. Dr Ohhira Probiotics are recommended globally by health and wellness professionals. Dr. Ohhira’s Probiotics should be avoided if there is hypersensitive to any component of a probiotic-containing product. Pregnant women and nursing mothers should use with caution. Some herbal and prescribed medications may interact with this supplement.